Let’s start this column by clearing up a major misconception. Mongolia was, and still is, a cold, barren region where the main food sources are herd animals and a very few hardy root vegetables (potato, turnip, onions). Gengis Khan (my favourite of the Khans) is more likely to have barbecued a goat over a stone pit than to have tossed a few vegetables on his shield for an impromptu stir-fry, as Mongolie Grill would have you believe. Fact-stretching aside, the Mongolie Grill (a chain, but not to be confused with the short-lived and truly horrid KT’s Mongolian Grill, formerly of Bayer’s Road Shopping Centre) has an interesting premise. 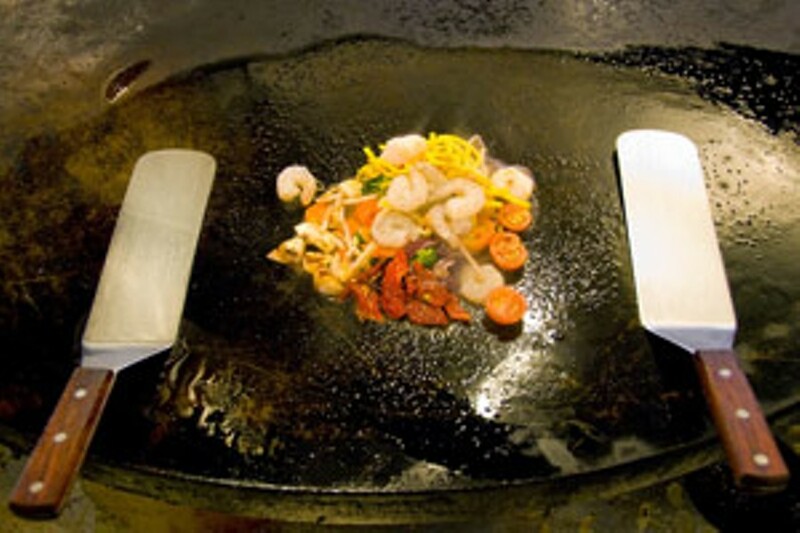 Customers are presented with a small stainless-steel bowl, which they move along a salad bar set up with about a gazillion ingredients and sauces. You pass the bowl to the cook, who weighs it ($2.59/100g), tosses it around on a giant circular flattop and brings it to your table. If you prefer, you can hang around the grill and watch the food being prepared. The Grill has set up in the old home of the Sports Hall of Fame, not quite the nomadic people’s yurt-like decor, but spacious with plenty of room for your tribe. After our enthusiastic server explains how things work, we head to the ingredient bar to make our selections. All sorts of vegetables are fresh and crisp in spotless little bins. After the vegetables comes a protein bar of beef, shrimp, chicken and nuts. Suggestions for combinations and amounts are helpfully posted along the way. Crushed garlic and ginger lead the way to the 18 different sauces available. The sauces are flavourful (we sample a few before settling on two: teriyaki and coconut) and with the abundance of fresh ingredients, hopes are high for a great meal. Both our bowls, almost full, ring in under nine bucks (one gets the 20 percent vegetarian discount). With the meal comes a choice of soup (there are two), steamed rice and the thin delicate crepe-like wrappers that usually accompany Chinese moo shu pork. We have one of each soup: a corn chowder and a hot-and-sour soup. The corn chowder tastes like cream of mushroom and the corn is largely AWOL. The hot and sour is hot. It’s so hot that I, even with a high heat threshold, can’t take more than two spoonfuls. It stays uneaten. Out comes a thermos jar of the sticky rice and that helps cool the fiery soup. Shortly after, the cook arrives with our plates looking askance to see which of us ordered what. We look aghast---our bright, colourful, crisp vegetables are cooked to a soggy, dark-brown mess. Both plates look identical, although we chose different ingredients and sauces---unappealing. We dig in anyway. The flavours we anticipated have been lost in the overcooking process. My garlic has an unpleasant, burnt taste, tainting my dish. All of the lovely vegetables in the second plate are unidentifiable mush. Our Chinese crepes resemble two napkins and were obviously factory made and frozen at one time. They’re left uneaten. A return visit is in order, but alas---the cooks we encounter are trained the same way---a second trip through Mongolie Grill yields the same overdone results. It’s truly a shame because it’s a great concept. So many beautiful ingredients means you could eat here cheaply and quite often and never get bored---if the cooks used a bit of a lighter hand in the cooking.